“I had thought it more like three or four,” I said. “I see that you are still well,” for he was as upright as ever, had added no weight, and his hair was only slightly touched with silver. That evening, after Martha, Holmes’ housekeeper, had gone, Holmes and I settled on either side of the fireplace in his study, a room not dissimilar in its untidiness to our old sitting room at Baker Street. Here were the old brass coal-scuttle, the Persian slipper filled with tobacco, other old friends including the shelves of Holmes’ invaluable scrapbooks, and there was still a table littered with his chemical apparatus, though I have no doubt it is now devoted to the mysteries of apiculture rather than the defining of poisonous alkaloids. I reached for one of his scrapbooks and passed it across to him. He thumbed its pages for a few moments, then began to read from a news-cutting. My mind raced back twenty years to 1903. The previous summer Holmes had announced his intention to retire and I had left Baker Street. 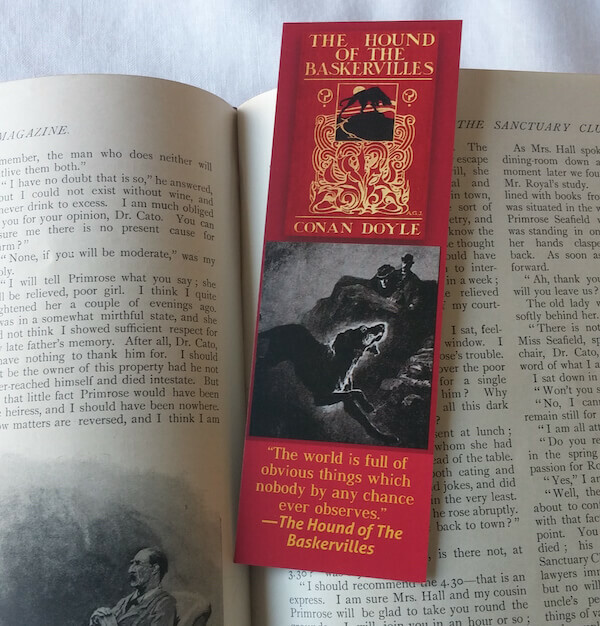 I had a sufficient income from my pen to meet my modest needs but I missed the stimulus of the footfall on the stair that had, so often, taken Holmes and I on the path of adventure, mystery, and danger. Accordingly, I lost no opportunity of visiting our old lodgings and, indeed, accompanied my friend on many of his last enquiries. So it was that I was at Baker Street when Mrs. Hudson announced Mrs. Honoria Phillimore. Our visitor was a lady in late middle age, dressed in pale grey linen, with a veiled hat. Holmes settled her in the basket chair and once the veil was lifted, I could see that her eyes were red-rimmed from weeping and her features pale and drawn with some great sorrow. She started. “You know?” she said. “Who was left in the house?” asked Holmes. “He returned to the house. What did you do?” Holmes lay back in his chair with his eyes nearly closed. “Tell me about your son,” said Holmes. “Over what matter?” enquired Holmes. “Then their dispute must indeed have been a grave one,” said Holmes. “How long was it before Mr. Phillimore brought him back?” asked Holmes. We accompanied Mrs. Phillimore to Welton Square, a quiet area lined with prosperous houses such as she had described. Holmes questioned each of the servants, but learned nothing. He examined every inch of the garden, lens in hand, swooping, plunging, and peering like some great dark bird seeking its prey under the shrubs. He examined with great care the lock of the gate in the rear wall of the garden. As we left the house, a police constable appeared around a corner of the Square. Holmes approached him and introduced himself. “Were there no footmarks?” I asked. “But what would be the cause?” I asked. “If I am right in my surmises,” he said, “we are in very dark waters indeed, Watson.” But he would vouchsafe me no further comment or explanation. The Mission in Wharton’s Row was a dark and insalubrious place, close to the docks. There we met the Reverend Bledlow, a thin, pale, exhausted cleric, who told us that Danny the street-sweeper had come to the mission about a year earlier. “Was he able to write?” asked Holmes. “And you have no idea of his present whereabouts?” asked my friend. We examined the pathetic items which the crossing-sweeper had left. There was a seaman’s pocketknife, a cheap tin tobacco box and a few rags of clothing. I recall that among them was a greasy, tattered strip of necktie which my friend examined and held up to the light, even turning it inside out. We left the Mission no wiser than we had come. That is all I recall of the affair. Months later when I enquired of his progress on the case, Holmes informed me that he had come to a dead end. “But why should the crossing-sweeper have driven Phillimore to flee?” I asked. Not another word would he say on the subject during the rest of my holiday, but when I left for London Holmes accompanied me. As we alighted on the platform at Victoria Station a young man in civilian clothing touched his hat to us. We accompanied him to the tea-room where he laid a manilla envelope on the table. “I dare say that there are still some who remember me as an unofficial meddler with elaborate theories,” interrupted Holmes. He strode away and we collected our luggage, found a cab and made our way to my home. After dinner that night, as we sat over a bottle of port, I could contain myself no longer. “The religious mark?” I enquired. “The Black Hand Gang!” I exclaimed. He paused and looked straight at me. “I have explained to you on many occasions, Watson, the significance of patterns in any investigation, whether visual or otherwise, and I rarely forget one once I have noticed it. I asked him if it was a school tie. “Recollection flashed into my mind. ‘Were you long at Chorling College?’ I asked, and when he confirmed that almost all his teaching had been done there, I asked, ‘Do you by chance recall a boy named James Phillimore?’ Whereupon he said that he did and produced a photograph of a Rugby football team with the boy in the front rank. “‘Do you know what became of them?’ I asked. “‘Phillimore,’ he said, ‘went to the bad, I’m sorry to say. Robbed his family bank and ended up in the river.’ He shook his head sadly. “And where did it take you?” I asked. “To a realisation that I had broken one of my own rules in narrowing my analysis of the case too early. I had convinced myself that the root of that singular tragedy and those monstrous crimes lay abroad. I realised that the explanation lay, instead, in that boyhood friendship at Chorling. “But he returned for his father’s funeral,” I objected. Holmes shook his head slowly. “No, Watson. Frank Smallfish saw the opportunity presented by Phillimore senior’s death and returned to England to commence a daring and heartless imposture that enabled him to rob Phillimore’s Bank of the sums he had promised the brotherhood in Italy for their services, or perhaps even for the sums they may have demanded in blackmail. Armed with a knowledge of James Phillimore gained from their long friendship, strengthened by their accidental resemblance, he was successful for several years. “You believe that he killed James Phillimore, then?” I said. “They were able to confirm what I suspected. That Smallfish was an assumed name, based upon the Sicilian ‘Pisciotto.’ It means ‘small fish,’ Watson, and the Black Hand use it in our sense of ‘small fry’ to refer to the petty criminals who carry out the organisation’s routine tasks. Frank Smallfish’s family may already have had connections with the brotherhood in the past. The following afternoon we stood in a great cemetery in the East of London. Holmes, after a word at the keeper’s lodge, led me to an unkempt patch of grass, unmarked by headstone or memorial, which lay under a far wall. He pointed with his stick.